Drumsticks making an educational and nutritious addition to Nandri! Our workers are busy removing the weeds at the drumstick vegetable plantation yard at Nandri Center. 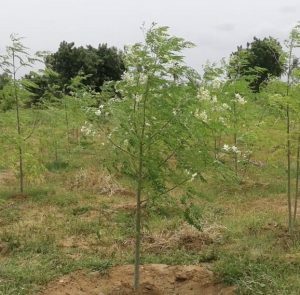 Drumsticks, also known as Moringa, are vegetables loaded with valuable minerals, healthy proteins and essential minerals, making it a very healthy food. It is used as one of the ingredients in sambar, a type of stew. Being high in nutrients and tasty in nature, the leaves and pods of this green vegetable possess blood purifying properties and it also acts as a potent antibiotic agent. We have created this drumstick yard to help train our agricultural students who come to Nandri to learn how to grow and tend crops. In addition, we will showcase the plantation as a model as we bring forward our initiative to introduce allotment farming to our Nandri families. It is mostly women who do the weeding and even if they work along side men, the women get lower remuneration for their work. The physical work done by these workers will bear fruit within six months and we will use the drumsticks in Nandri Centre in the delicious South Indian food we will prepare for our guests and participants in our training programmes.